"...Just contacting you to again tell you how delighted we are with your work. From design to whole garden completion, the whole team were professional, hard working and extremely reliable. You kept us informed of your progress and any difficulties were always dealt with ensuring minimum delay to the Project. The neighbours were also very complimentary about how you kept any disruption to a minimum and cleaned up daily during the Project. We have had great comments from friends, family and neighbours (even the window cleaner made a point of telling me what a great job you had done!) and hope we have sent some business your way! ..."
"I have to say I am completely delighted with the work I've had done in my garden. When I moved house last year I inherited a garden that was rather overgrown and in need of some real TLC. I found Arthur and Simon by chance on Google and later discovered that they also do work for a couple of my new neighbours. They have completely transformed my garden and really gotten it into shape for the year ahead. They've done so much work, I'd have been at it all year in my spare time and not done as much. We now move on to more regular maintenance and long term planning giving me and my family the time to enjoy the garden to its full. I'd have no hesitation recommending Arthur and Simon Landscapes"
"I have used Arthur and Simon now on two occasions and I find them very professional and extremely efficient. Most of my dealings have been with Simon who is very polite and respectful, whilst being focussed and keen to provide a high standard of customer satisfaction. As a customer I can be a bit pedantic however, nothing appeared to be too much trouble for Simon. The landscaping team were also pleasant and keen to deliver a high spec finish. The retired population in my local area have also commented as to how polite the guys were and the fact that they were always happy to discuss progress with them. Although I suspect that progress was greatly hindered with the amount of questioning they will have received!!! All in all I would not hesitate to recommend Arthur and Simon, a good company that does exactly what it says on the tin! What more do you need." 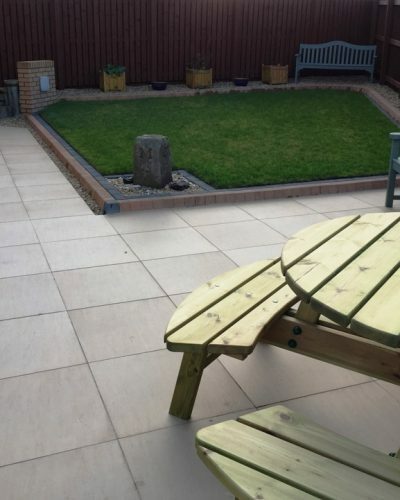 "Arthur & Simon Landscapes, carried out a comprehensive upgrade to my garden and driveway. Substantial earth removal and back filling with Type 2. Building earth retention walls with blocks & brickwork to create three levels, interconnected by a ramp and steps. Laying large cement base areas for paving and a shed base. 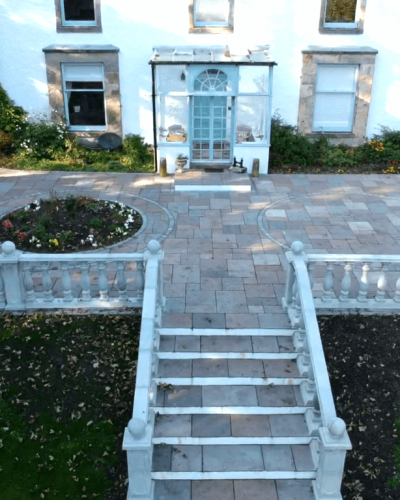 Large porcelain paved areas of steps, patio and paths. Extending a block paved, sloping driveway, including a ramp to another level. Drainage was installed for all areas. Extensive trenches were dug for electric cable laying & waste drains. Laying a new grassed area and edging with blocks. Preparing earth and laying underlay for extensive gravelled areas. Changes to the work specification were accommodated. This was a 'once in a lifetime' project. The end result produced by Arthur & Simon was what I had envisaged. Although it may sound like a management buzz-phrase: 'They exceeded my expectations'." "Absolutely thrilled with our front garden. The guys were really friendly and extremely hard working in difficult weather conditions. Many thanks again Arthur and Simon. Would not hesitate to use you again." From design to whole garden completion, the whole team were professional, hard working and extremely reliable. You kept us informed of your progress and any difficulties were always dealt with ensuring minimum delay to the project. The neighbours were also very complimentary about how you kept any disruption to a minimum and cleaned up daily during the project.